Are you planning on going to the movies with your kids, renting them DVDs, or allowing them to watch movies online in the near future? If so, you might be interested in the results of a new study just published in Drug and Alcohol Dependence, suggesting that adolescent movie viewers exposed to certain types of tobacco smoking scenes may be at increased risk for initiating smoking. The study, published by Shadel and colleagues at the RAND Corporation, involved more than 350 boys and girls aged 11-14 years old, who viewed movie clips containing smoking scenes. About one-third of the group viewed clips in which smoking facilitated social interactions, one-third viewed clips in which smoking was portrayed as relaxing, and one-third viewed clips in which smoking was not portrayed as positive or negative. All subjects had previously viewed clips of smoking-free movies selected because their content otherwise matched that of the smoking scene they would view. Risk for smoking was assessed when subjects viewed both smoke-free and smoking scenes, using a modification of a questionnaire previously shown to predict future smoking. Adolescents exposed to movie scenes depicting social smoking were more likely to experience an increase in future smoking risk. And, among those exhibiting increased future smoking risk, exposure to scenes portraying smoking as facilitating relaxation also was associated with increased future smoking risk. This is a key area for future research and policy because of the link established between smoking in movies and future smoking risk. 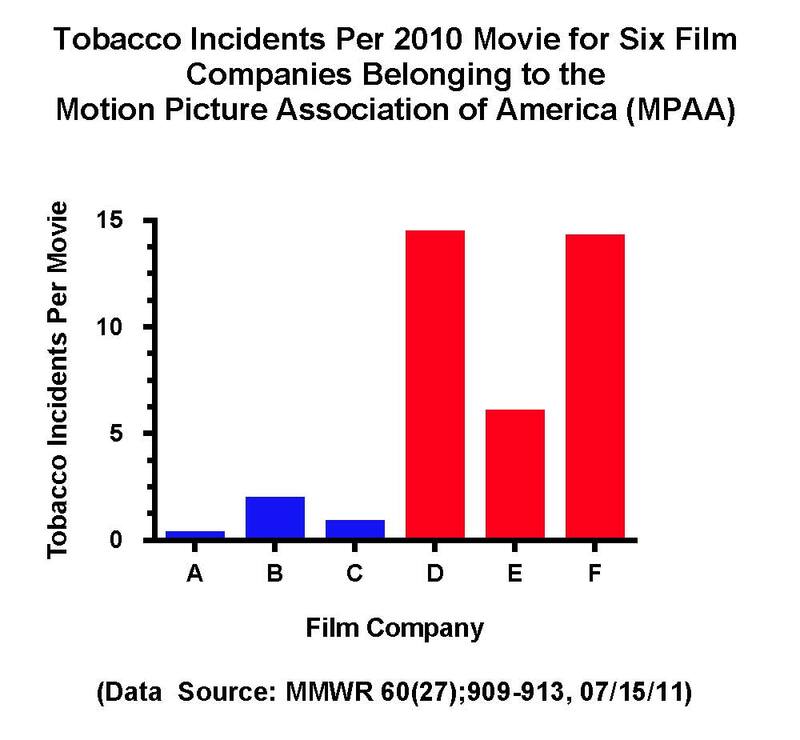 Although the current film ratings system of the Motion Picture Association of America (MPAA; G, PG, PG-13, R, NC-17) does not permit any portrayals of drug use in G or PG films, tobacco and alcohol scenes are not excluded from such films. In this regard, the Centers for Disease Control and Prevention (CDC) published data last July in the Morbidity and Mortality Weekly Report (MMWR) on the number of smoking scenes in the 137 top-grossing movies including youth-rated movies. The report noted that the numbers of smoking scenes in movies are on the decline versus a peak in 2005. This is due in large part to a 96% reduction in the numbers of smoking scenes in films produced by 3 of the 6 members of the MPAA with published policies on excluding smoking content in top-grossing youth-rated films (Figure). 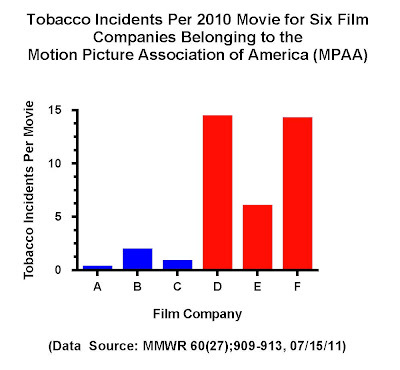 However, given the link established between smoking scenes and risk for smoking, the MMWR report suggested that an R rating be assigned by the MPAA to movies with any smoking scenes. CBSNEWS HEALTHWATCH reported that the MPAA members without published policies at the time of the MMWR study were News Corp. (20th Century Fox and Fox Searchlight); Sony (Sony Pictures and Columbia Pictures); and Viacom (Paramount Pictures, MTV Films and Marvel). To date, these companies have not adopted published policies, and earlier this month, the National Association of Attorneys General sent letters to Rupert Murdoch, Chair and Chief Executive of the News Corporation, as well as to heads of other companies producing movies, urging them to adopt anti-smoking policies for youth-rated movies. The Shadel study adds to the growing literature documenting risk for smoking after exposure to films containing smoking themes, and provides further evidence that smoking scenes should be banned from youth-rated films. If you are interested in finding movies that do not contain smoking content, the Smoke Free Movies website, a project of Professor Stanton A. Glantz at the University of California, San Francisco, rates current movies for their smoking content.